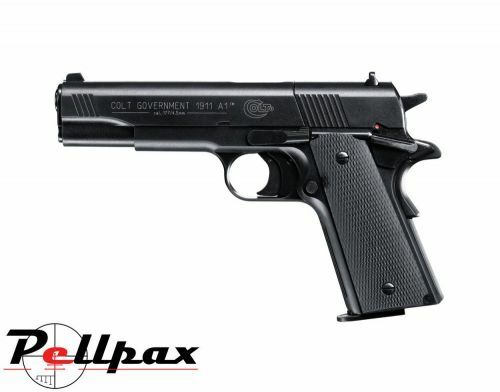 The Umarex Colt 1911 Black with Plastic Grip is a Co2 Powered Air Gun. This CO2 Pistol belongs to the most successful weapon constructions of the world. In the dynamic shoot contests of the IPSC and Bianchi Cup marksmen, the Colt Government is as always the dominating weapon. The CO2 Version possesses all good characteristics that champions of an "Action Shooting" expect weapon including high power, pin point accuracy and a comfortable grip. This pistol also comes housed in a hard case complete with 2 x 8 shot magazines.